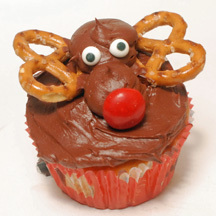 You’ll need to bring out the pastry bag and metal tip for this reindeer cupcake, but the results are worth the effort. I’ve seen variations on this idea in several places, and this is my take on the design. What You Need: 1 cupcake; chocolate frosting; 2 mini pretzel twists; 1 red M&M; 2 candy eyes (or use mini M&Ms); pastry bag; coupler; metal tip #5. How to Make It: Frost cupcake. Load chocolate frosting into pastry bag with tip attached. Starting about one-third of the way down from the top edge of the cupcake, pipe a “blob” of frosting for the reindeer’s head. (Don’t move the pastry bag or tip much; just squeeze steadily in one spot and then stop squeezing before pulling away.) Then, below that, pipe a second, smaller blob for the muzzle. Prop a pretzel on either side, add M&M nose and candy eyes and you’re done! This entry was posted on Saturday, December 13th, 2008 at 1:36 pm	and is filed under Christmas cupcakes. You can follow any responses to this entry through the RSS 2.0 feed. Responses are currently closed, but you can trackback from your own site.